The air conditioner is fully automatic, and will maintain the desired temperature at a constant level. To achieve this, the temperature of the air supplied to the interior, the blower speed (volume of air delivery) and the air distribution are regulated automatically. The system also allows for the effect of strong sunlight, so there is no need for manual adjustment. 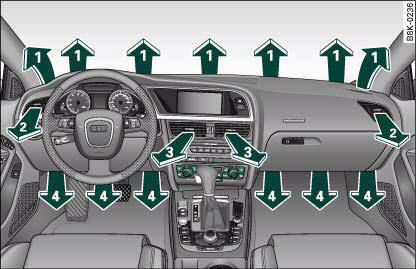 For these reasons it is advisable to use the automatic mode for the comfort of all the passengers in virtually all conditions throughout the year. • The grille on the control console, fig. 112 must be kept free. Please ensure that it is not covered by stickers or similar. Measuring sensors are located behind it. 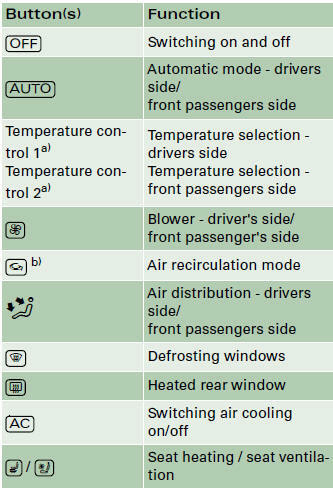 – Press the OFF button for at least 2 seconds to switch off the air conditioner and cut off the supply of fresh air from outside the vehicle. The display will show “OFF”. 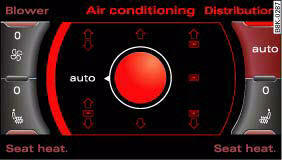 The air conditioner will switch on again if you operate the temperature control. 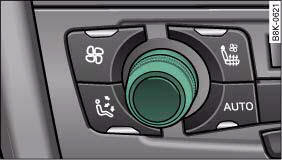 You can press the OFF button when the ignition is switched off to activate the "residual heat" function. The system will then heat the interior using the remaining heat in the engine coolant. 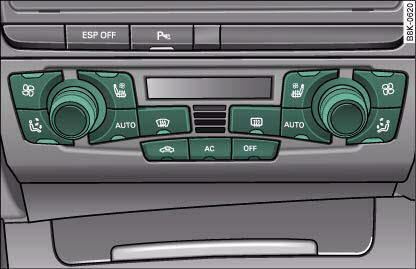 Separate temperatures can be selected for the driver's and front passenger's sides. – Turn the rotary control anti-clockwise to reduce the temperature or clockwise to increase the temperature ⇒ fig. 113. 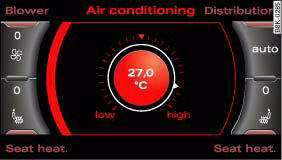 The temperature setting will be shown on the display of the air conditioner console. The temperature setting will be shown on the screen ⇒ fig. 114 for a few seconds if the sound system or MMI* is switched on. 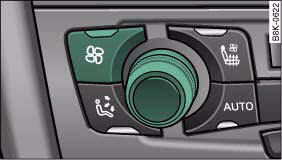 The air conditioning system automatically regulates the blower speed according to the interior temperature. 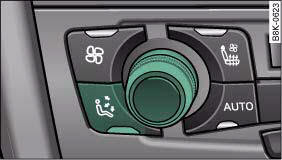 However, you can also adjust the blower speed manually. The blower speed will be shown on the screen ⇒ fig. 116 for a few seconds if the sound system or MMI* is switched on. Switch to for automatic control of the air distribution. 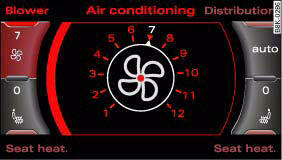 The air distribution setting will be shown on the MMI display ⇒ fig. 118 for a few seconds if the MMI is switched on. The flow of air from the outlets is controlled either automatically or manually, depending on the operating mode selected. All the outlets can provide air which is either heated, unheated, or cooled. The heater outlets for the rear footwells are located under the front seats.